Windsor Marquees offers the highest standards in marquee hire in the Forest Of Dean area, priding ourselves on personal service, care and attention to detail. We aim to make your event a perfect and successful event. We specialise in marquees and accessories hiring and our dedicated staff are here to ensure you can relax and enjoy your day, whatever the occasion within the Forest Of Dean and its surroundings. The Forest of Dean is one of the most popular visitor attractions in the whole of Gloucestershire, boasting breathtaking walks, sculpture trails, small market towns and is well within easy reach of the M4 and M5. The Forest of Dean is made up of small towns such as Coleford and Cinderford and is ideally situated between the Rivers Wye and Severn, with the Forest of Dean being home to some of Britain’s most spectacular countryside. Luckily, despite being one the last remaining Royal Forests in the whole of the UK, the Forest of Dean has still maintained to keep its heritage and tradition, with local attractions such as Clearwell Caves and The Model Village proving this. 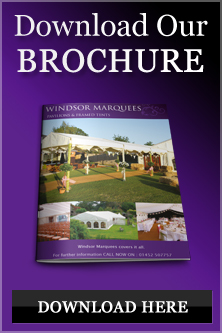 Windsor Marquees have been hiring marquees in the Forest of Dean for around ten years, serving businesses, leisure facilities, accommodation and entertainment venues with a wide range of marquee and canopy hire. We have catered for numerous weddings in the area, and also frequently provided marquees for events and business hospitality.